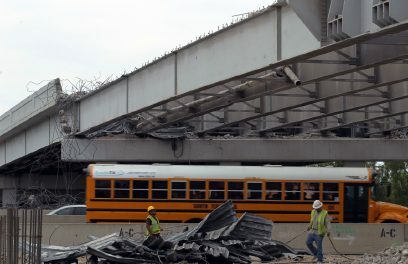 The Bicentennial bridge overpass is seen under demolition on Thursday, September, 6, 2018, in McAllen. McALLEN — All lanes on Expressway 83 between 2nd Street and 29th Street will be closed Monday night due to construction. The frontage roads will remain open during this closure. All westbound traffic can use the 2nd/10th Street exit to get on the frontage road. Drivers can use the entrance ramp west of 29th Street to get back on the expressway. All eastbound traffic can use the 23rd Street exit to get on the frontage. Drivers can use the entrance ramp east of Main Street to get back on the expressway. The Texas Department of Transportation tentatively does not have other planned closures as it demolishes the Bicentennial Boulevard overpass, which is part of a state-funded $46 million construction project for a 3-mile stretch of U.S. 83 from McColl Road to Ware Road. 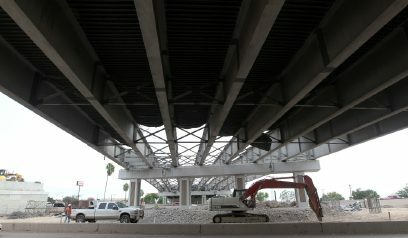 Traffic flows underneath the demolition of the Bicentennial Overpass on Thursday, September, 6, 2018, in McAllen. A view from the frontage off Bicentennial street over looking the overpass on Thursday, September, 6, 2018, in McAllen . 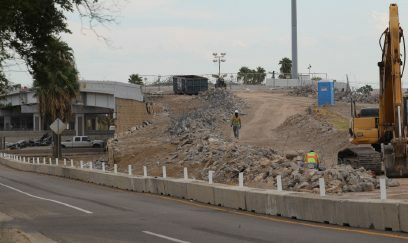 In order to cross U.S. 83 using Bicentennial Boulevard, a popular route to access La Plaza Mall and McAllen-Miller International Airport, drivers will have to wait until at least a year from now. The overpass closed in August, and it is now being demolished. The city of McAllen has recommended drivers use 10th Street, 23rd Street or other north-south corridors to access the mall, airport or other northern or southern areas in the city and beyond. Upon completion, U.S. 83 will cross over Bicentennial Boulevard, similar to how it crosses over 10th Street and 23rd Street. The completed project will increase the capacity for more vehicles and make it a smoother drive for drivers, said Octavio Saenz from TxDOT. This construction project intends to smooth the flow of traffic, Saenz said. The entire 3-mile construction is set to be complete in 2020. TxDOT canceled a planned closure Thursday night “because all the concrete removal was effectively done” Wednesday evening.